The U.S. Army is known for being a boots-on-the-ground organization that deals with nitty-gritty reality rather than the pixel-filled world of apps and status updates…but that may change as the U.S. Army rolls out modernization plans. According to plans outlined by ArmyTimes, troops may soon be given the choice of an iPhone or Android-based device as part of their standard equipment, albeit with ruggedized cases to help the devices stand up to more wear and tear. Soldiers would be able to access applications developed specifically for their duties, whether that involve pulling up specialized maps, marking up photos, translation utilities to help soldiers interact with people all over the world. 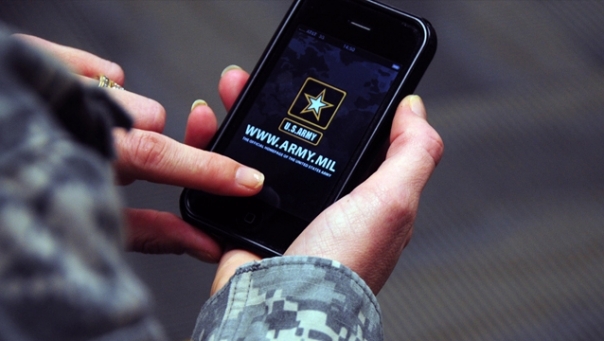 According to the report, the Army is already issuing test mobile phones to students at selected bases and plans to begin putting phones into the field as early as February 2011, with Command Access Card readers for the iPhone and Android devices as soon as April, so soldiers could securely access email, calendars, and other information. The Army is also considering a monthly stipend to soldiers so they can customize their phones with applications appropriate to their roles. The Army sees the smartphones as a way to not only enable soldiers to access needed information from any location as they need it, but also as a “force multiplier” enabling soldiers to more quickly report information and operational intelligence back to commanders. Phones are highly portable, and many of today’s soldiers can compose text messages faster than they can type, which in exercises has led to a significant increase in the amount of intelligence and detail soldiers report back. The interactive nature of the devices mean commanders can also quickly ask questions and send instructions—for instance, asking a soldier to send a picture of something they’ve seen. The phones will also feature specialized applications that, say, enable soldiers to view video from aerial drones or mark up photos with important tactical information, and the Army is working on mobile communications hubs that can be installed in vehicles, packs, or lofted in balloons to bring communications services to areas that have no usable mobile communications infrastructure. The Army’s efforts may not end with smartphones: devices like iPads, Kindles, and pico-projectors are also getting attention from the armed forces.